We came home this afternoon to find the bees in the early stages of swarming! Swarming is a natural reaction to favorable conditions by bees. They create a new queen and about half of the bees leave the hive with her to form a new colony elsewhere. 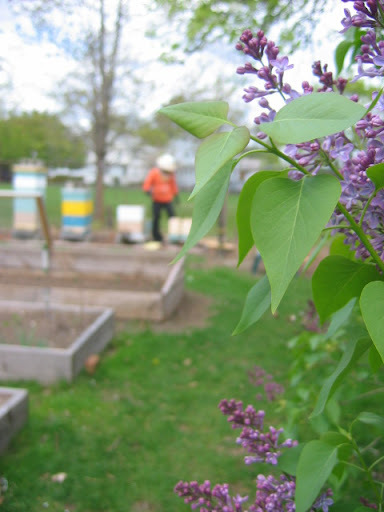 This may be good for the bees, but it means that we have less bees to help make us honey. 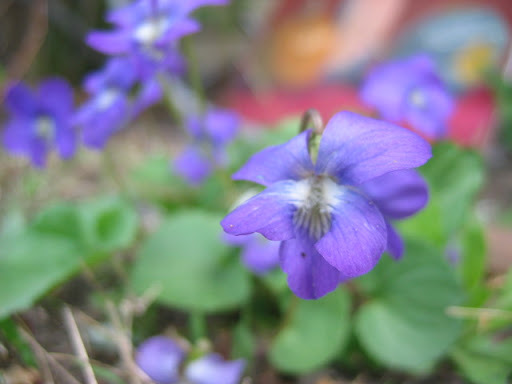 Moreover, since we are not there to take care of the bees that leave are very likely to die. So, really, nothing good comes of it. 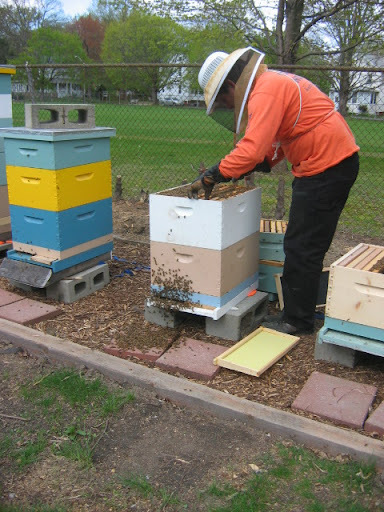 Therefore, we stepped in to prevent the bees from swarming! 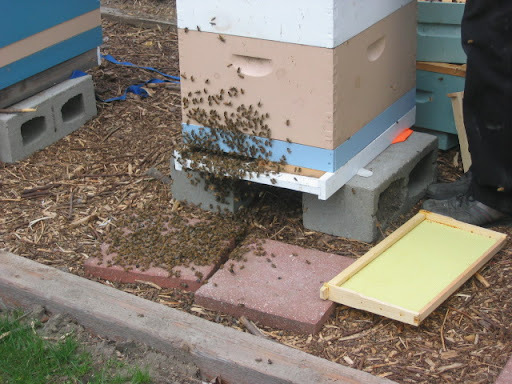 Here you can see the mass of bees clustering on the ground in front of the hive and on the hive itself. Given another half an hour these bees might have all been in the air with a newly hatched queen off for who knows where! So, into the bee suit! I had to think quick. I decided to make a "split". 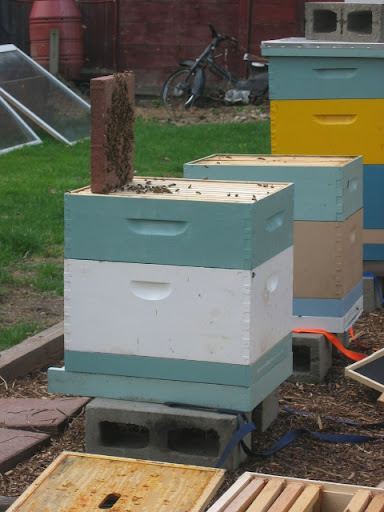 This creates an "artificial swarm" by dividing the bees in half so think they've swarmed. Here I divide the bee hive in half. Now some bees "think" they've left the hive, since they are no longer in a hive with an active queen. You can still see there are lots of bees in both sides, thousands of bees in fact. 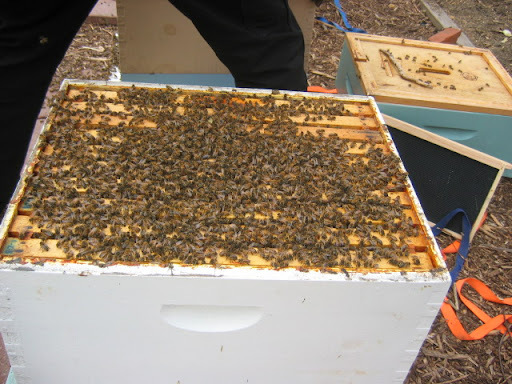 They started to swarm as a result of the colony being very healthy and of having used up all the room in the hive to lay eggs. The queen needed more room, so the bees decided to set off! I shook the bees that were forming the swarm back into the hive. These bees are the "leaders" if they settle in chances are good the "split" tactic will work. 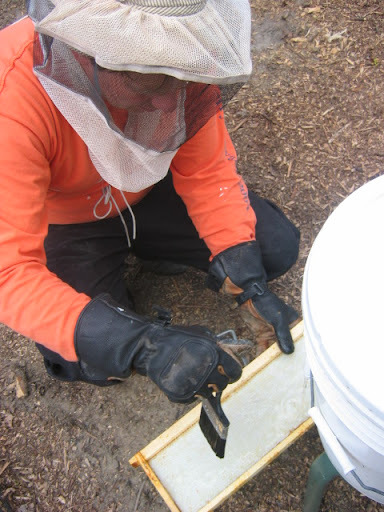 I painted some sugar syrup on empty frames to get bees to create wax comb in it. Bees will often draw comb (create wax) int he presense of weak sugar syrup. Time of of the essence here, since the bees are in a swarming mood! Anything I can do to help them draw comb, I will do! It's very important that the bees draw comb quickly since the queen has filled all the available space with eggs and brood! The bees have been doing great this summer with the warm snap early on. This type of situation normally occurs in May or June. 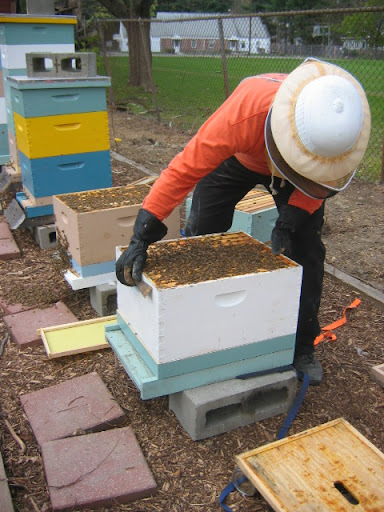 Hopefully the bees will quickly draw out new comb for the queen to start laying on so they won't swarm even though we divided the hives! And the combs go back in the hive! 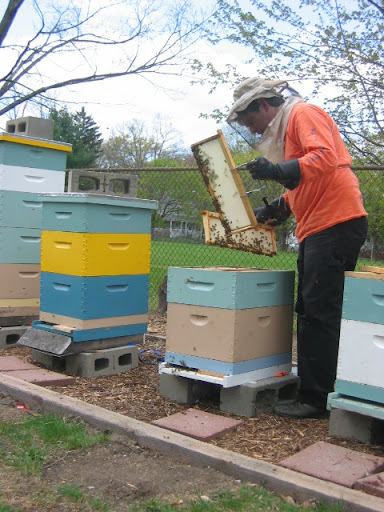 Since conditions are so conducive to swarming (days getting longer, lots of natural pollen and nectar, strong hives etc) we still will have to work to prevent swarming this spring. Even this split isn't the final step for these two hives. We'll have to take them apart again this Friday and see what's happening inside. That's bee keeping! There's always a lot to learn. Oh! already?? Thats SO soon!.. Looking forward to the next blog when we will know if what you did made a difference! Keeping my fingers crosssssed!